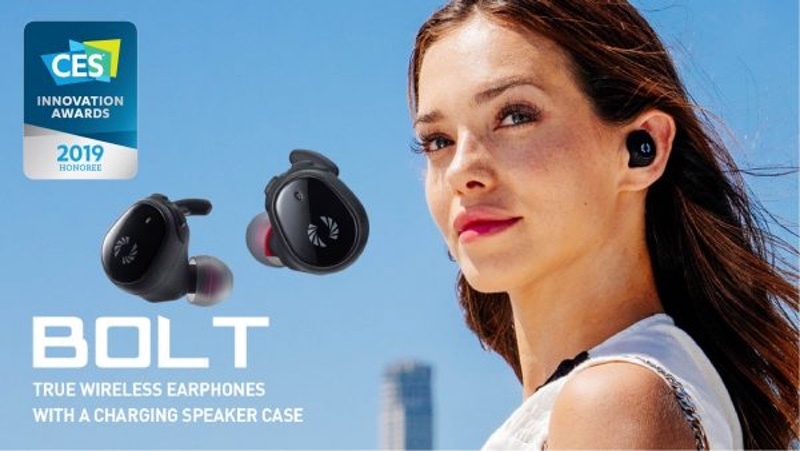 Phiaton, a premium manufacturer of high-performance personal audio products, has announced that its recently released BOLT BT 700 wireless earbuds product was named a 2019 CES Innovation Awards Honoree by the Consumer Technology Association. Phiaton’s BOLT BT 700, which features a charging case that doubles as a portable speaker, will be on display in the Innovation Awards Showcase at CES 2019 on January 8-12. The CES Innovation Awards are sponsored by the Consumer Technology Association, owner and producer of CES, the world’s largest and most influential technology event. The CES Innovation Awards recognizes honorees across 28 product categories. A panel of judges, including designers, engineers and members of the tech media, reviews submissions based on design, functionality, consumer appeal, engineering and how the products compare with competition. BOLT’s charging speaker case provides up to five hours of music playing time per charge, fully charging the earphones up to three times per charge, for a total of 20 hours of play time. Its quick charge feature allows for one hour of music playing time on the earbuds from just a 15-minute charge. Featuring Phiaton’s Balanced Armature Technology, BOLT delivers ‘fine-tuned, high resolution audio and faster response with impressively detailed sound.’ Phiaton adds that the drivers make each vibrant note come alive so users can experience mid-high frequency tones and hear all the textured nuances and detail of the original sound. BOLT BT 700 offers touch interface controls and buttons on the earphones for convenient music and call controls with the swipe of a finger, including access to Siri and Google Assistant for hands-free voice commands and IPX4 sweat and water resistance for use while working out or on the go.